Vanessa Vine coming to the North Coast! 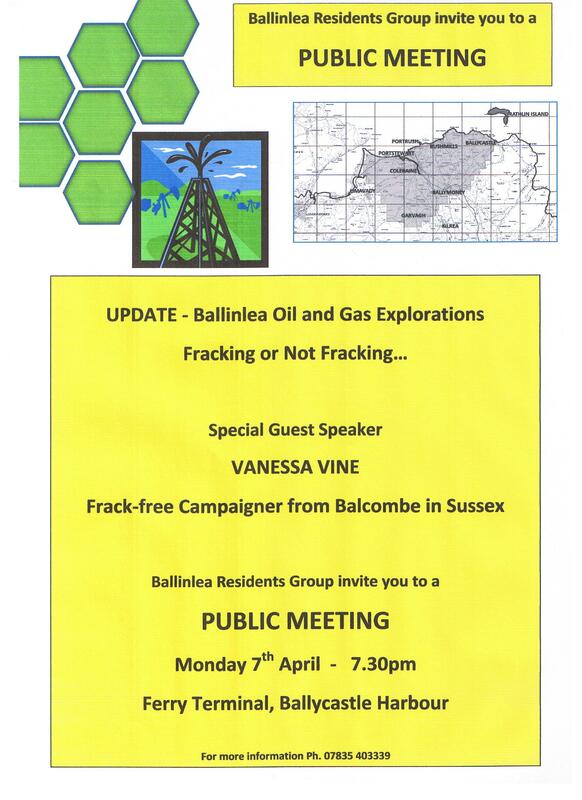 Vanessa Vine, Founder of Frack-free Sussex, and Britain and Ireland Frack-Free (BIFF), is coming to the North Coast. She’s been meeting with anti-fracking campaigners across Ireland and Northern Ireland, and visiting areas that are at risk from unconventional hydrocarbon extraction – areas like the Rathlin Basin – i.e. most of Northern Ireland’s North Coast. She will be sharing her campaigning experiences from Balcombe in Sussex, and other exploration sites, like Barton Moss, with local people here. She will be speaking in Ballycastle at 7.30pm on Monday 7th April, in the Ferry Terminal. This entry was posted in Uncategorized by MB. Bookmark the permalink.